High Society (1956) starring Bing Crosby, Grace Kelly, and Frank Sinatra is one of the 1001 classic movies you should see. The movies made in old Hollywood between 1930-1970 are an integral part of America's cultural heritage, so, with that in mind, each Monday I'm going to recommend a classic movie you should watch (click here, for my reasons behind the 1001 series and a review of The Philadelphia Story, 1940). This week's offering is High Society (1956), a swellegant musical with big stars, great songs, and MGM's luxe production values. High Society, which is a musical remake of the aforementioned The Philadelphia Story, centers around Tracy Samantha Lord (Grace Kelly), a wealthy heiress who is from one of the oldest families in Newport, R.I. Tracy's divorce from jazz musician Dexter Haven (Bing Crosby) and her upcoming remarriage to a noveau riche coal magnate (John Lund) has attracted the attention of a Spy magazine reporter (Frank Sinatra) and photographer (Celeste Holm). Louis Armstrong and Grace Kelly on the set of High Society (1956). During the 1950's, movie attendance began to dwindle because of the rise of television. At the time, most TV shows were made on a shoestring budget and aired on small black-and-white sets, so Hollywood executives decided to lure audiences back to the big screen with splashy productions and glamorous stars. The Philadelphia Story was one of MGM's biggest hits of the 1940's so studio honchos retooled the script, added some songs by composer Cole Porter, and got the hottest stars in Hollywood to perform big production numbers in glorious Technicolor. MGM's strategy paid off: High Society was the ninth highest grossing film of 1956. 1. Louis Armstrong. High Society benefits from the talents of four musical legends, but even Crosby, Sinatra and Porter are dwarfed by the talents of Armstrong, who, accompanied by his own band, sings and plays the trumpet in several numbers. 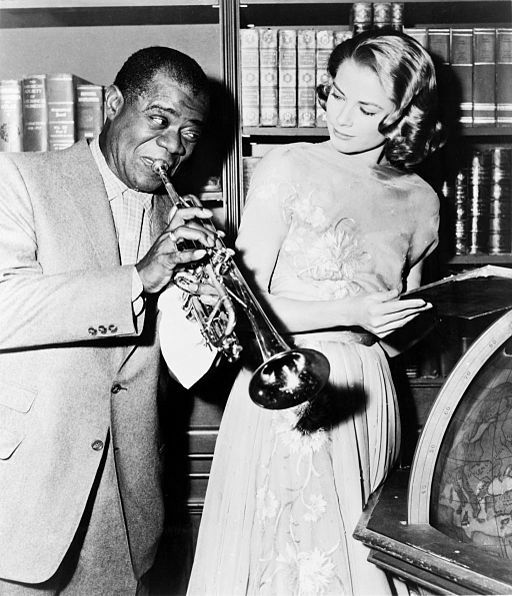 The highlight of the film is Armstrong and Crosby's duet to "Now You Has Jazz," and the popular crooner's musical and physical embrace of Armstrong must have spoken volumes to 1956 audiences. 2. Kelly. Many critics complain that Kelly was miscast in High Society, but I disagree. Kelly was actually a better fit for playing a wealthy heiress than Katharine Hepburn -- Kelly's patrician demeanor and cut-glass accent were the products of her upbringing in Philadelphia society -- and she is quite good here, especially when she plays off her ice-queen persona in a funny drunk scene. 3. Kelly's costumes. Kelly also looks wonderful in High Society with gorgeous outfits designed by MGM costume designer Helen Rose. 4. Kelly's ring. Kelly met Prince Rainier of Monaco at the 1955 Cannes Film Festival, and they began a secret correspondence while she was making The Swan (1956). The pair became engaged over the Christmas holidays, and when Kelly returned to MGM to make High Society she was wearing her 10.5 emerald-cut diamond engagement ring from Cartier. Kelly wears it throughout the film, and you can't miss it: It's huge. 5. "True Love." This romantic duet between Crosby and Kelly (it's actually her singing voice you hear) was the biggest hit from High Society. It reached No. 4 on the charts and became the only gold record of Kelly's career. 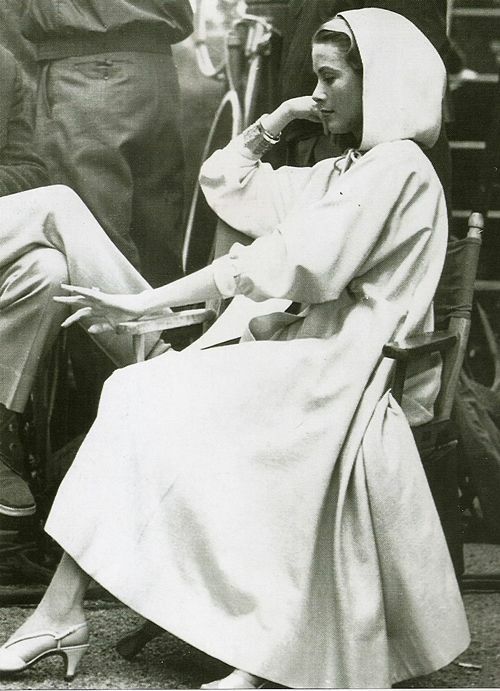 Grace Kelly admires her 10.5 carat diamond engagement ring on the set of High Society (1956). Other critics: High Society is a certified fresh at Rotten Tomatoes with an 80 percent rating, and Leonard Maltin calls it fluffy, but enjoyable in a three-star review for his Classic Movie Guide. Critics in 1956 were not so enthusiastic. Bosley Crowther of The New York Times wrote that High Society "misses the snap and crackle that its un-musical predecessor had." A Time magazine reviewer concurred, adding that "Sinatra plays the reporter like a dead-end kid with a typewriter." The bottom line: High Society isn't The Philadelphia Story, but no movie could live up to the near perfection of that film. 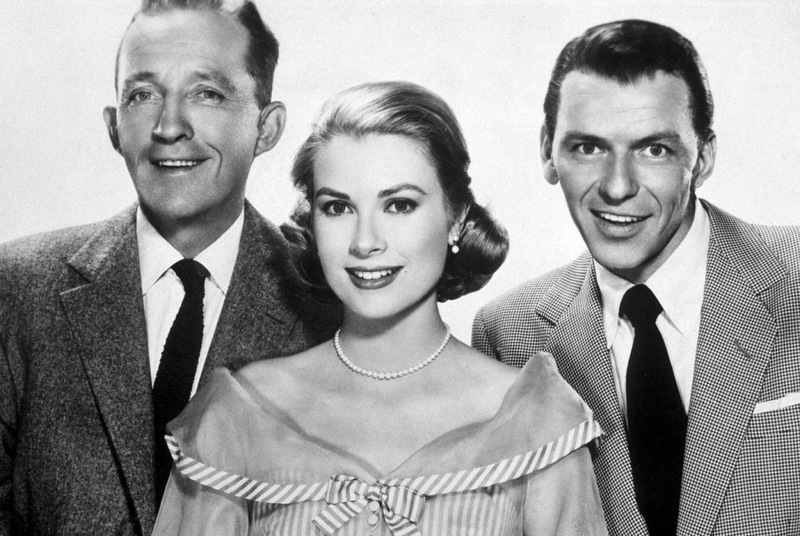 Instead, enjoy High Society for what it is: A fun, frothy musical with a great cast, good songs, and gorgeous Grace Kelly. Availability: TCM will air High Society at 6 p.m. Feb. 22, 2016. It also available for streaming on Netflix Instant and on DVD and Blu ray. Next Monday, I'll begin the February theme of Love and Marriage: Hitchcock Style with a look at Mr. and Mrs. Smith (1941). It has a delightful cast and some great songs (especially "True Love"), but I always end up thinking it should have been better. Of course, I'm not a huge fan of THE PHILADELPHIA STORY, so that may be part of my problem. I'm with you on Grace's casting; I thought she was quite good. I do think both Crosby and Sinatra should have stepped up their game. They're great when they are singing, but. otherwise, they kind of just walk through the movie. A few years ago "High Society" was on TCM in the afternoon when my daughter brought a couple of friends home to play video games. One of her guests held up the game because he knew that "Well, Did You Evah?" was coming up. This proof that there is hope for the younger generation did my heart a world of good.